more vulcans from the perpetual files! 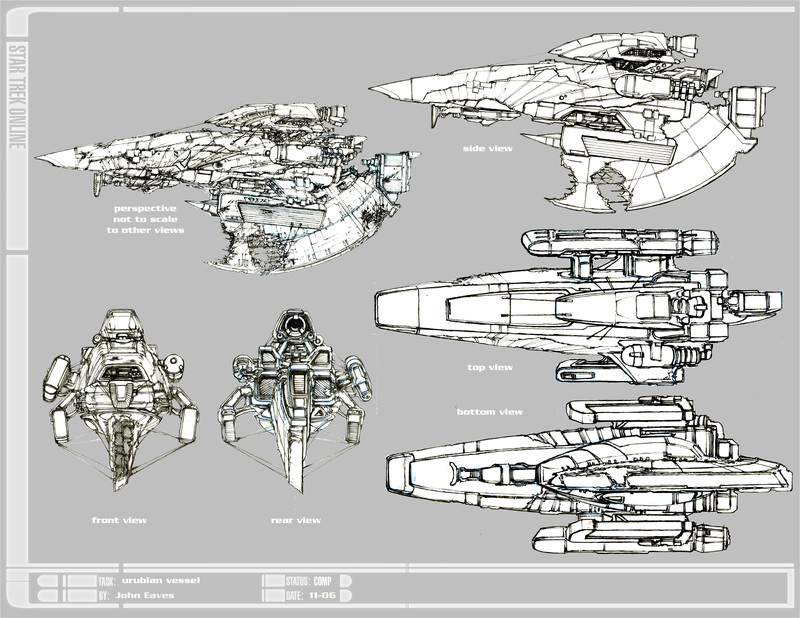 Here are more sketches and plans of future Vulcan ships from the Perpetual files!!! Live long and prosper,,, Well at another gaming company anyways!!!! and one following in the shadow of the all powerful Doug Drexler design!!! From the Perpetual files come three more vessels from the long extinct ST Online game created by Perpetual Entertainment. Sadly, this project disbanded over a year ago, and the creative forces have scattered across the USA in pursuits of other work and projects. Ryan Dening and Todd Ramen were the two guys I worked for, and their roles were as the production coordinator and production designer. I really miss working with these guys as well as the whole team. They were doing some amazing work and everything was looking pretty darned incredible, but $$$ to produce a game is high and funding issues left this one smashed against the rocks. Fun times and fun crew. Here are some renderings they had me working on, and they were a lot of fun to draw up. A Ferengi style boomerang ship! always fun to do a Vulcan!!! It’s been a while since we looked into the Perpetual Star Trek Online folder, and in so doing I came across an odd little ship called the Urubian scrap vessel. 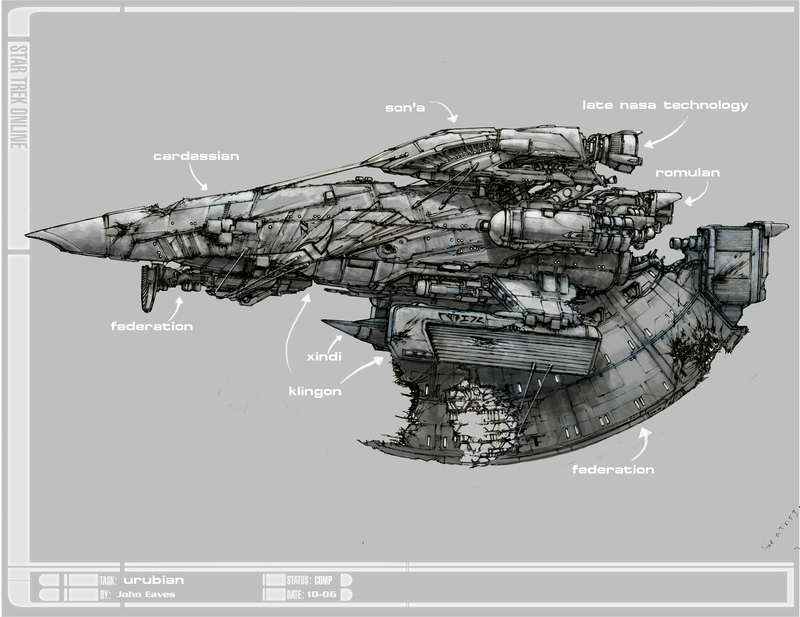 The race is made up of Scavengers and here they have created a space craft from relics of the Borg and Dominion wars. There is a little bit of everything here and be sure to get your tetanus shot before you join on as one of the crew. From the lost files of Perpetual comes this little asymmetrical deep space science vessel. Bristling with probes and sensors , this little ship maps space, galaxy’s and all it’s celestial wonders. There is only a B&W of this one. Here is a science vessel from the Perpetual files. this was the first of the donut ships and looking at it again I have to cry at the bad painting in Photoshop,,, OHHH those early PS learning days were rough!!!! this one was fun to work on because it was loosely based on a big fav of mine the USS Grissom. At this point in the game deadlines were getting tighter and the execution of the renderings were getting rougher as to what was turned in. New modelers were being brought on and the load of things to be built was on the rise. As always I would have liked a little more time to work this one out a little more. The underside details were a later addition requested to add thickness to the ships profile. It’s a frumpy addition that doesn’t really add much to the functionality of the vessel.. Here is another one from the Perpetual files. This little Federation ship was my first project when i started working with Ryan and Todd. It’s classified as Starship despite its small scale. My mind was still in Nemesis mode so my thoughts were into merging elements as opposed to having them segmented. it was a fun lil ship to start off with and I have the ortho’s to this one as well.